What’s happening this First Friday in Rittenhouse Square? Can you believe it’s May already? Celebrate the Spring weather this week by checking out our selection of events happening in and around Rittenhouse Square this First Friday, May 3rd. Flight Patterns, a solo exhibition by Trudy Kraft. Kraft’s dreamy mixed media artworks are inspired by a range of influences, including “folk, aboriginal, and Far Eastern art”, Hinduism, Buddhism, and travels to exotic places. This exhibition, Flight Patterns, is centered around birds and imagery of flight, which “challenge the viewer to experience her paintings for both their decorative and meditative properties”. Trudy Kraft studied at the Moore College of Art here in Philadelphia, and at the Arts Students League in New York City. This is her fourth solo exhibition. Her work brings to mind textile work and tapestries, and are created using a mixture of media, including watercolors and gouache. Image: Trudy Kraft, Flight Patterns #12, Mixed media on paper, 40 x 25.5 inches. This exhibition, with works by three artists from PAFA here in Philadelphia, asks “Why do some experiences keep their vivid quality while others change and fade?” The series of works show memory as an abstract place, leaving viewers “to ponder the space between what is known and what is imagined”. Amanda Bush is a painter from South Mississippi. She uses oil and acrylic to recreate ethereal landscapes inspired by her memories of the South. 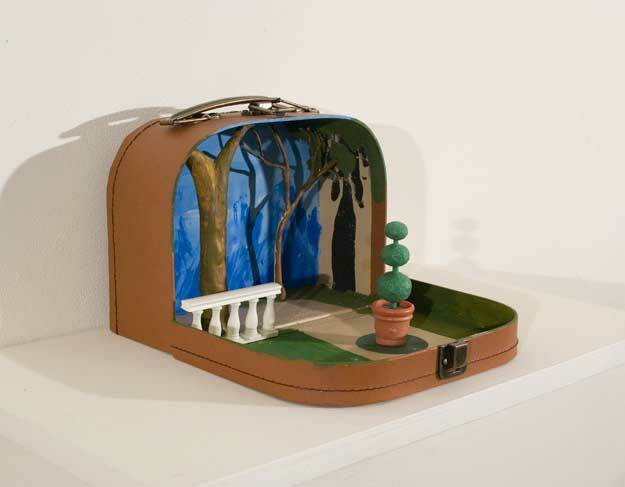 Joan Turner studied at PAFA and UPenn, and creates fantastical dream-like oil paintings and assemblage to explore “the implications of multiple realities of cultural identity”. 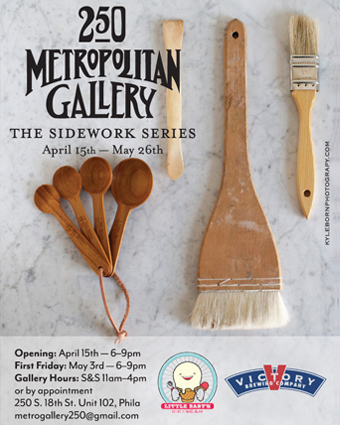 This First Friday event is part of the Metropolitan’s “Sidewalk Series’, which is a new exhibition dedicated to artists in greater Philly who share their time between working on their art and working in the culinary industry. This Friday’s event will feature limited edition Sour Cherry, Sea Salt & Dark Chocolate Cookie-flavored ice cream from Little Baby’s Ice Cream, as well as a performance by local folk duo the Sun Flights. You can find out more and RSVP on Facebook. Categories: Art, Exhibitions, Philadelphia, Philly, Rittenhouse Square | Tags: First Friday, Gross McCleaf, Little Baby's Ice Cream, Metropolitan Gallery, Trudy Kraft | Permalink.